Last updated Wednesday, May 2, 2018, at 11:42 a.m. There are two different ways to view your grades in MyBlugold CampS. If you wish to see your final grades for a specific semester, or (possibly) your midterm grades, see Checking Midterm and Final Grades. If you wish to view the grades of all your college courses at one time, you can View Course History. 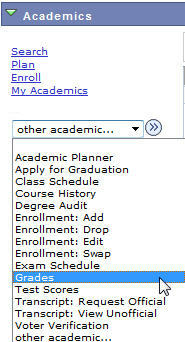 From the Other Academic... dropdown menu on the left, select Grades. Click the double arrow to the right of the dropdown menu. You will then see a list of all the terms you have attended UW-Eau Claire. Select the radio button next to the desired term and click Continue. In the chart that appears, you will see two tabs -- Mid-term Grades and Official Grades. Select the desired tab to view your grades. NOTE: Whether or not a mid-term grade is posted in MyBlugold CampS depends on the instructor -- you may or may not have mid-term grades for your classes. To view a different term at any time, click Change Term near the top of the screen. From the Student Center page, in the Academics section, click My Academics on the left-hand side of the screen. Here you will see a number of options. Click View my course history. You will see a list of all the courses you have taken, whether you took them at UW-Eau Claire or transferred them to UW-Eau Claire. Along with each course number and description you will see the term in which you took the course, the grade you received, the number of credits, and the status of the course (taken, transferred, or in progress). NOTE: If you wish, you can use the Sort option to sort and view your courses differently.